I hope that you all (I am trying to learn Texan in honour of Jackson, not bad, eh?) 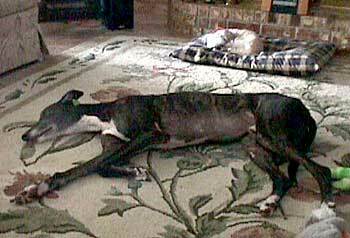 had a fun weekend - are you "Thinking like a Greyhound" yet? I think that Daisy and Jackson wish that we would take a course like that so we would think more about eating and sleeping and less about swimming and walking! You mentioned that the instructor had Doberman's - they are the greatest dogs. We were fortunate to have a black-and-tan female who lived to be 14 years old. We were with her when she was born and Dawn was in the backyard with her with she passed away due to a heart attack. Sometimes that "circle of life" is just a bit too ... well, I don't really know what the word is.... but it is indeed. But, sorry for the digression. So, I hope that you guys and the pups had fun. I think that Jackson had fun this weekend in the pool. This was the first time that he had a full 45 minute session; he had been in the pool twice before but only for a short time each session. We started off by putting Daisy in the pool and letting her swim her laps. Then in went Jackson - he partly walked down the ramp, then had to be lifted into the pool. He is so cute with his red life jacket on, his big eyes, and his tongue sticking out of the side of his mouth. Kendall, the instructor, only worked with him: she would guide him around and have him follow Daisy, and then stop him in the shallow end and let him touch the bottom (with his front paws on the ramp). Because he only moves his front legs, she also spent time moving his back legs for him so that he would get a sense where his rear legs were and what they were supposed to be doing. After about 15 mins, he started to move his rear legs on his own. We all cheered him on, telling him what a good boy he was. Meanwhile, Daisy is still swimming lap after lap - although sometimes she would swim in very small circles, looking to see what Jackson was doing. After a short while, Kendall took off Jackson's life jacket and he sort of swam. Well, mostly Kendall supported him, but it did approximate swimming!! Since he had done so well and had been working at it for about 1/2 hour, we figured we would end on a good note and we got him out of the pool. His technique had improved with Kendall's help and also because he seemed to be mimicking Daisy. They were drying him off and I was walking around the outside of the pool, supervising Daisy's laps, when I mentioned that Jackson loved squeaky toys and it was too bad that we didn't have a waterproof one as I figured that it would motivate Jackson. Kendall walked over to the bookshelf and grabbed a toy and gave it a squeak - Jackson flew around the pool deck and was beside Kendall in a heartbeat, wanting to get that toy. We all looked at each other and at Jackson and back into the pool he went. We used the toy to coax him in and he walked in quite well. Once he was in the water, Kendall would squeak the toy and throw it ahead of Jackson. He would move his legs as fast as he could, water flying everywhere, and swim to the toy. When he caught it, he would stick his face in the water, grab the toy, shake it and squeak it. Then Kendall would repeat the procedure and Jackson would eagerly "swim" towards the toy. Water, noise and waves everywhere! Jackson really seemed to be enjoying it. Meanwhile, Daisy, little miss marathon swimmer, is still swimming her laps - hardly causing a ripple in the water. Poor Daisy ended up swimming for a whole hour - she was totally tuckered out for 2 days. Jackson was pretty sleepy himself the next day. We are going to go every week for 3-4 weeks as it seems as though Jackson is understanding the swimming concept and we want to reinforce that. Kendall thinks that once he has got it, we will be able to give him a great (low impact) workout since he is so motivated to chase the toy. Next time we will attach the toy to a rope and have him chase it. See, we're Thinking like a Greyhound, right??? ?